Who doesn’t like the crispy crunch of tempura? 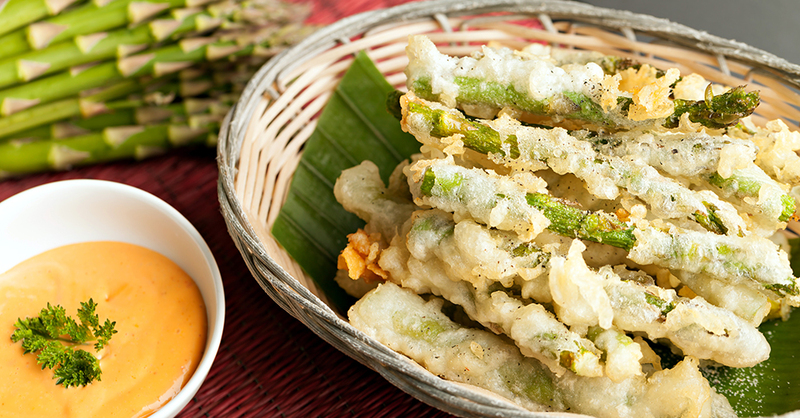 Whether you are planning on hosting a dinner party or just want to have a quick snack around the house, this asparagus tempura is perfect! It combines all of the deliciously crisp and green flavors of asparagus with the even more satisfying crunch of the tempura coating. It’s also a great way to get the kiddos to eat their veggies…shh! Serve as an appetizer alongside a larger dish or by themselves with the delicious dipping sauce. Either way, this incredibly simple and delicious recipe is sure to make you want to prepare a fresh batch as soon as you finish your first serving – we always make extra! Whisk egg whites in a large bowl until they form soft peaks, then whisk in flour and club soda. Set mixture in the refrigerator to cool and make the dipping sauce by combining the mayonnaise with lemon juice and sriracha. Stir until fully combined, then refrigerate until ready to serve. Pour 2-3 inches vegetable oil into a heavy-bottomed pot over medium-high heat. Remove tempura batter mixture from fridge and dip your asparagus in the batter, gently shaking off any excess over the bowl. Carefully lower asparagus into oil in small batches and cook for 3-4 minutes, or until batter is golden brown. Remove when ready and place on a paper towel-lined plate to drain. Serve hot with dipping sauce, and enjoy!